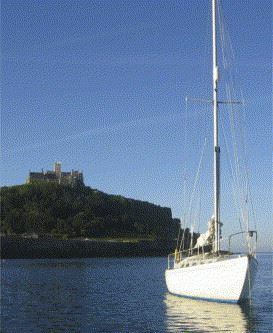 By the late ‘70s and early ‘80s, thousands of GRP cruising sailboats like these (seen off St Michael's Mount, Cornwall) were in modest series production. As well as making leisure craft accessible to the general public, fibreglass has permitted the large-scale production of working craft, like this catamaran from South Boats, Isle of Wight. Fifty years ago, if you wanted a yacht, it would be custom built for you, as a one-off, usually by fastening together hundreds of separate hand-crafted pieces of wood. Most boats of any size, including working craft, were built this way. Only the well-off could afford them. But the boat building industry was about to jump ship from wood to a novel ‘wonder’ material. Fibreglass, as it was generally known, offered the prospect of continuous monocoque structures that would start and stay watertight, along with ease of building whole series of identical boats. Fibreglass/glass reinforced plastic (GRP) went on to transform boat building from a small-scale enterprise steeped in wood and tradition to what is rapidly becoming a commodity industry. 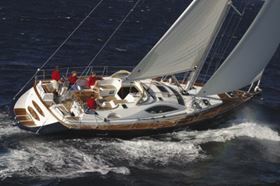 Today even median earners can aspire to a new Jeanneau, Beneteau, Bavaria etc. Workboat numbers have multiplied alongside the ensuing leisure craft explosion. Meanwhile, however, the old tradition of commissioning an individual bespoke vessel from the board of a gifted designer never actually died. Indeed, in recent years it has been re-invented. The key is high-performance composites, lusted after by the rich and sponsored who, with the help of specialist fabricators and structural engineers, have used them for craft of prodigious size, performance or both. Vessels like Ellen MacArthur's B&Q Castorama and cutting-edge canting keel racers would be virtually impossible without composites, while the likes of Mirabella V, the world's largest sloop and the ultimate charter yacht, show the impressive scaleability of composite con-struction. In a new twist to the story, we see high-performance composites edging down-market into production craft, via series-built performers like the breathtaking Volvo 70s of recent racing circumnavigation fame. Actually, although Reinforced Plastics magazine first saw the light of day at about the time this boat building revolution was getting under way, the history of fibreglass boats extends a couple of decades further back still. According to US sources, Ray Greene, an employee of the Owens Corning company, produced a composite boat as early as 1937, but did not proceed further at the time due to the brittle nature of the plastic used (it was most likely phenolic). Experi-menters experienced other difficulties too. When Basons Industries tried to produce a fibreglass boat in the early 1940s, no release agent was used and the hull could not be extracted from the mould. Mould and hull were eventually disposed of by rolling them into the Bronx River! All the materials needed were coming together during the 1930s. Glass fibres were known to the ancients but mass production of glass strands only became possible from 1932 when a researcher with the Owens Glass company accidentally directed a jet of compressed air at a stream of molten glass and produced fibres. After Owens Glass joined up with the Corning company in 1935, the method was adapted by Owens Corning to produce its patented ‘Fiberglas’ (one ‘s’). Product researchers could see the potential for combining cloths of this material with a plastic, but had to wait a few years more for a suitable resin. DuPont was awarded a patent for polyester resin in 1936, though the first direct ancestor of today's polyester resins emerged from American Cyanamid in 1942. Peroxide curing systems were in place by then. These developments effectively unleashed the composites revolution. Combining polyester with glass fibres provided an alternative to conventional materials that, by mid-World War 2, were in increasingly short supply. Military aircraft and naval constructors had first call, but Ray Greene was nevertheless able to produce a fibreglass sailing dinghy in 1942. Other ‘plastic’ boats followed, an example appearing at a US boat show in 1947. Altogether, it's likely that thousands of fibre-glass boats, some quite small, existed by the late 1940s. Fibreglass surfboards, too, were making a splash, the first known example dating from 1946. (A board of glass/foam sandwich construction appeared in 1949). This gives the lie to the common mis-perception that fibreglass boats have existed only from the 1950s, although serious production for the commercial market started about then. The first fibreglass yacht was probably the Arion, a 42 ft Herreshoff-designed ketch that appeared in 1951. That was a one-off, but Ray Greene had, by 1957, built 175 of a 25 ft Sparkman & Stephens design, making him a series production pioneer. That baton was then taken up by the Pearson Corp which, from 1959, produced its popular 28 ft Triton sailboat. In Europe the first fibreglass boats appeared in the early 1950s. A Tod 12 ft dinghy, produced in 1951 by W&J Tod utilising an early Crystic polyester resin from Scott Bader, is credited as having been the first, though it was run close by a Flying Twenty sailboat produced in 1952 after a meeting between Isle of Wight-based designer Uffa Fox and Patrick de Laszlo, founder of the Halmatic company. Halmatic went on to construct, in 1954, what it claimed to be the world's first large GRP boat. Its Perpetua, a 48 ft 8 in motor cruiser moulded with Crystic resin, was produced to demonstrate to the British Admiralty that a GRP craft could withstand the vibration of diesel engines. Halmatic has since produced thousands of working and leisure craft, and remains a leading producer of GRP vessels today. The 1950s and ‘60s saw an influx of new constructors who, attracted by the low starting investment needed, were happy to satisfy the public's desire to get afloat. Many built boats in conditions that would be laughed out of court now. An enthusiastic entrepreneur could acquire a draughty shed, assemble a few semi-trained laminators, build a mould from inferior materials, buy some fibreglass and a drum of resin, and be in business. Personnel, devoid of protective apparel, would lay up by hand layers of chopped strand mat and roll and/or brush resin into them, having first mixed the resin with catalyst and accelerator in a bucket. Cure would take place under whatever ambient conditions offered. Not surprisingly, the quality of fabrication varied wildly between constructors and with the same constructor on different days. Strangely enough, despite this, most of the fibreglass boats that have ever been made survive to this day. This owes something to the fact that early boats were somewhat over engineered. Generous lay-ups have contributed to longevity and, though we now know that GRP is far from being the maintenance-free material originally anticipated, most of the problems that occur, even the dreaded blisters caused by hydrolysis/osmosis, can be managed and do not mean writing off the structure. It remains to be seen whether those craft that are now being mass produced down to a price and within increasingly rigorous emissions constraints will survive for so long. It is said, for example, that some boats built soon after the oil crises of the early 1970s are more blister-prone than others because there was pressure on prices and hence the quality of the materials and lay-ups used. In the 1960s GRP boat building really took off. Jeanneau, in France, moulded its first GRP hull in 1960. A fleet of 22–27 m GRP trawlers were built in South Africa during the decade, while the US Navy and Royal Navy started looking into the possibility of producing minehunters in GRP because this material would not trigger magnetic influence mines. (A prototype for the RN's Hunt class minehunters, among the largest GRP vessels ever produced, emerged during the 1970s). The 17.4 m yacht Sir Thomas Lipton that won the 1968 Single Handed Transatlantic Race was an early example of GRP sandwich construction. By the 1970s all sorts of craft including ships' lifeboats, fast rescue lifeboats such as the Royal National Lifeboat Institution's 16.5 m Arun class, fishing vessels and fast power boats were being produced in GRP. Since then, this versatile material has added rigid inflatable boats (RIBs), personal watercraft and large multihulls to its credit list and today there is scarcely a type of vessel, from the humblest canoe right up to warships and fast catamaran ferries, that is not built in GRP. If fibreglass made the mass production of boats possible, the boat industry returned the compliment by providing a major launch pad for the reinforced plastics industry. In the 1960s the marine market became the largest consumer of reinforced plastics, though it would later be eclipsed by automotive use. Glass/polyester was and remains the primary material mainstay for marine constructors. But the materials palette was expanding. Improved isophthalic resins complemented the original orthophthalics, while protective gel coats developed apace. Glass refinements included improvements to the strands themselves, along with development of more ordered uni- and multidirectional continuous-fibre cloths. DuPont launched its Kevlar para-aramid fibre, benefiting structures subject to high shock and impact loads. Vinyl ester and epoxy resins were introduced. Epoxy, short for polyepoxide, dates from work carried out in the 1930s in the USA and Switzerland. First used in marine circles as a wood adhesive and moisture-resistant coating, epoxy resins tantalised builders of performance craft with their superior toughness, weather and moisture resistance and other superior properties. ‘Tantalised’ because, at first, constructors could not afford to use them as matrices, so aerospace had first bite. Similarly, when the UK's Royal Aircraft Establishment at Farnborough (later Qinetiq) devised a way of producing super-strong carbon fibres in 1963, these would be out of reach for some time. Initially, carbon was used in selective areas of boats that were predominantly glass. For example, two rowing ‘shells’ used in the 1972 Munich Olympics utilised both reinforcement types along with epoxy resin. Carbon racing shells followed from companies like Carbocraft in England. Racing dinghies began to benefit, then performance yachts. One of the first carbon sailing vessels was the high-speed trimaran Colt Cars GB, engineered in 1980 by Isle of Wight-based Structured Polymer Systems Ltd (subsequently SP Systems and now Gurit). This craft, which also utilised Kevlar, was wet laminated and vacuum bag consolidated and cured. At the time, it was said to be the largest composite structure apart from the Space Shuttle loading bay doors! Thanks to the rigidity, strength and low weight of these and subsequent craft, carbon has since become a byword for structural performance. Its use has spread with reducing cost differentials and rising affluence. Low-temperature laminating resins have helped too. Today, carbon is even used for upper-end production yachts, notably by Poncin Yachts in France and Denmark's Shipman Yachts. Away from hulls and decks, it is also used for hi-tech masts, spars, sails, foils, rudders, steering wheels and other marine items. The emphasis on low weight for high performance has also promoted the development of sandwich construction using structural foam cores such as Airex (Alcan Composites), Divinycell (DIAB) and Corecell (Gurit/SP). Processes have moved on too. Spray-up quickly emerged as a faster alternative to hand lay-up. Open moulding was made less ubiquitous by vacuum bagging. A gradual transition to closed moulding is still in progress as regulators wage war on styrene and other volatiles. Following the introduction of prepreg materials into aerospace by Hexcel and others in the 1970s, prepregged marine craft started appearing from 1980, the process being particularly suited for carbon structures. These materials have been joined by ‘semi-preg’ systems such as SPRINT (Gurit-SP). There could hardly be a greater contrast than between the ‘bucket and brush’ era of the 1950s and the leading edge of marine composite construction today. Modern performance craft are highly and precisely engineered. Structural engineers, the new marine aristocracy, use computer-aided design, computational fluid dynamics and other software to define vessels virtually before they are produced for real. They also use software to deliver laminate specifications. Manufacturers carry out lamination under close environmental control, using technical textiles or prepregs. Twin examples of recent work carried out by a leading marine structural engineer serve to point up the contrast. High Modulus (Auckland, New Zealand and Hamble, UK) has engineered the primary structures of two very different vessels that are truly at the leading edge of what is now possible. One is for a 130ft Wally yacht being billed as the world's fastest upwind sailing yacht. High Modulus used detailed finite element stress analysis and Matrix Applied Computing to design an ultra-light structure stiff enough to resist buckling and other loads. This number crunching, backed by long experience of in-service behaviour and materials testing, resulted in a detailed laminate specification based on the use of high-strength and intermediate modulus carbon fibre prepregs. Panel stiffness is tuned by specifying the densities and thicknesses of Nomex honeycomb cores sandwiched bet-ween the carbon/epoxy skins. The super-yacht has a lifting keel, a slim aerofoil rudder and an elegant interior designed by noted architects Foster and Partners. The second craft is an advanced 120 ft, 1000 ton motor yacht that will have to with-stand the forces involved in three 4000 hp engines driving her at up to 60 kts. Weight minimisation was a design mantra, calling for a carefully optimised sandwich structure using carbon/Kevlar laminate skins and Airex foam cores. The resulting structure is lighter and tougher than an equivalent laminate in solid carbon fibre, and half the weight of an equivalent produced in wet lay-up glass/epoxy with foam core. Custom-produced multiaxial carbon fabrics were flown to New Zealand from Europe for the job. It was decided to vacuum infuse the carbon-epoxy/foam structure in a female mould, and then post-cure it. Reinforced Plastics, having reported on a remarkable half-century evolution from simple ‘bucket and brush’ glass/polyester boat building to, on the one hand high-volume production of craft accessible to the general public and, on the other, to a performance driven high-technology sector, is eager to reflect the further changes in materials, techniques and products to come. McClarin Plastics has acquired Custom Composites, an Oklahoma-based manufacturer of polypropylene and composite glass fiber products.